Europeans are facing major challenges: terrorism, populism, national electoral dates, etc. On an economic level: investment, growth, employment, demography; the position of Europe in the new world power struggles, both from the trade and digital points of view. From an external standpoint: security, defence of Europe and its financing; uncertainty about transatlantic relations, turmoil in the Middle East, etc. The Schuman Report 2017 on the State of the Union provides a panel of the best experts on these issues to present and discuss them. A unique book, the 8th edition is a vital source of analysis and reflection for decision makers and observers alike. This work offers a summary of political Europe, an overview of the electoral power struggles within the Member States and the European Union, the political and economic representation of women, 36 original maps and 120 unique pages of commented statistics. 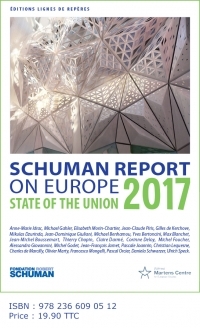 The 2017 Schuman report on the State of the Union is a vital tool more than ever before to understand what is at stake in Europe. The book which is edited by Thierry Chopin and Michel Foucher is published by Lignes de Repères.